Using surprising studies and stories spanning business, politics, sports, and entertainment, Grant explores how to recognize a good idea, speak up without getting silenced, build a coalition of allies, choose the right time to act, and manage fear and doubt; how parents and teachers can nurture originality in children; and how leaders can fight groupthink to build cultures that welcome dissent. Learn from an entrepreneur who pitches his start-ups by highlighting the reasons not to invest, a woman at Apple who challenged Steve Jobs from three levels below, an analyst who overturned the rule of secrecy at the CIA, a billionaire financial wizard who fires employees for failing to criticize him, and a TV executive who didn’t even work in comedy but saved Seinfeld from the cutting-room floor. 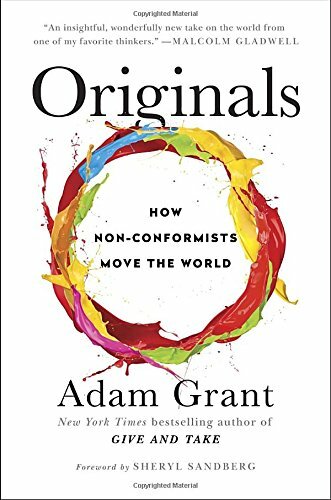 The payoff is a set of groundbreaking insights about rejecting conformity and improving the status quo.